Panera Bread has grown from the 20-store Saint Louis Bread Company to some 2,000 locations. The company says it will be acquired by JAB for $315 per share in cash. The investment firm that owns Krispy Kreme, Caribou Coffee and other enterprises, is purchasing the Panera Bread Co. for $315 per share in cash — a premium of roughly 30 percent over its recent average trading price. 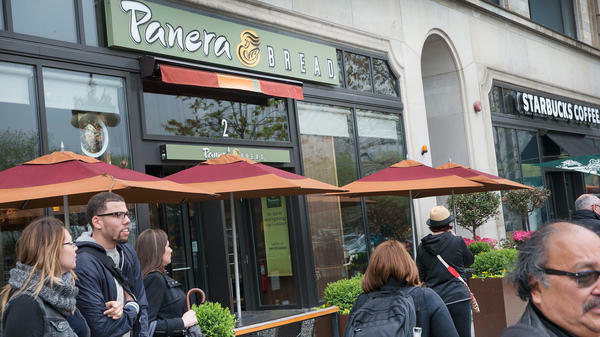 The deal with JAB Holding Co. is valued at around $7.5 billion, Panera said Wednesday. If the transaction is finalized in the third quarter of 2017 as planned, Panera would be privately held. News of the merger brought a spike in Panera's stock price. After closing at $274 a share yesterday, the stock soared to well over $300 in pre-market trading this morning. Panera says its board of directors has unanimously approved the definitive merger agreement with JAB. Panera has seen exceptional growth since the early 1990s, when it was created by the founders of Au Bon Pain. Louis Kane and Ron Shaich had purchased the 20-store Saint Louis Bread Company and then changed the concept and name to Panera. They eventually sold off Au Bon Pain to focus on Panera. The bread-centric café chain says it now has more than 2,000 locations, some $5 billion in sales, and more than 100,000 employees. In addition to Krispy Kreme, JAB owns coffee and breakfast companies from Jacobs Douwe Egberts and Peet's Coffee & Tea to Einstein Bros. Bagels.